Plastic reduction and recyclability are two of the main trends that dominated the first half of 2018. The year barely begun and news headlines started to fill with eco-friendly messages. First, the government announced its 25-year environmental plan to reduce plastic waste, then we heard about the proposal to introduce a 25p charge on disposable coffee cups. Modern customers are growing more eco-conscious too as TV series, including Blue Planet II, Eat Well for Less? and Jamie’s Quick & Easy Food put more emphasis on healthy living and environmental protection. 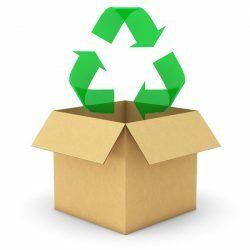 Below are a few ideas to help your business grow greener with eco-friendly packaging. Packaging offering the optimum fit for your products reduces your pack dimensions, allowing you to transport more parcels in your delivery vehicles. This means you could save on fuel and courier costs while minimising your CO2 emissions. Smaller, compact packages also require less filling material therefore minimising packaging waste. Provide recycling information on the pack to help customers responsibly dispose of packaging. This will make life easier for them and ensure all materials are recycled properly. Using packaging made of recycled or recyclable materials also shows you care about the environment not only on paper but, above all, through your actions! Parcels containing similar packaging materials, e.g. a cardboard box filled with paper cushioning, can usually be placed in to the same recycling container, making recycling even simpler for customers. If you use tape to seal your boxes, gummed paper tape (also known as water-activated tape) could be a great, eco-friendly alternative for you. It is made from natural, sustainable materials and does not need to be removed from boxes before recycling! You can read more about the benefits of gummed paper tape here. At Macfarlane Packaging, we work closely with our customers to help them build sustainable, eco-friendly packaging operations. These are really helpful tips for packaging business. Your article description is so good mainly the recycling process is so beneficial and time-saving according to me. And this can reduce the cost to make packaging. Anyway, you did a great job. Keep it up! Great Work folk, I just read your blog and I must say these tips are really helpful. The idea of Recycling and Eco-friendly solutions are amazing. And with these techniques it’ll be easy to make attractive and cost effective packaging. Appreciate your work! Hi John, thank you very much for your nice comments, we are delighted to hear you enjoyed reading our blog post!